Editor’s note: The ProxyHam project described in this story, along with the DefCon talk describing it, have been cancelled under mysterious circumstances. Read our update here. In the game of anonymity-versus-surveillance online, the discovery of the user’s IP address usually means game over. But if Ben Caudill has his way, a network snoop who successfully hunts a user through layers of proxy connections to a final IP address would be met with a dead end—while the anonymous user remains safe at home more than a mile away. 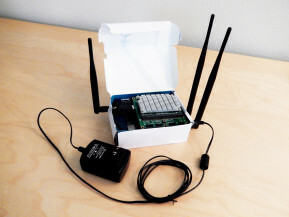 At the upcoming DefCon hacker conference in Las Vegas next month, Caudill plans to unveil ProxyHam or the online anonymity box, a “hardware proxy” designed to use a radio connection to add a physical layer of obfuscation to an internet user’s location. His open-source device, which he built for $200, connects to Wi-Fi and relays a user’s Internet connection over a 900 megaherz radio connection to their faraway computer, with a range of between one and 2.5 miles depending on interference from the landscape and buildings. That means even if investigators fully trace the user’s internet connection, they’ll find only the ProxyHam box the person planted in a remote library, cafe, or other public place—and not their actual location. The version of ProxyHam Caudill intends to sell at DefCon will be fairly basic. But in future versions he’s still developing, Caudill says the device will also include accelerometers designed to detect and warn users if it’s been moved from its hiding place. He’s even hoping to include a microphone that can act as a “black box” recorder to relay to the owner the last few moments of audio the ProxyHam hears before it’s disconnected. All of that, says Caudill, is intended to prevent investigators from discovering a ProxyHam and then tampering with it to eavesdrop on its communications or to trap a user who comes to fix or retrieve it.